JohnnyBall is a portable 3D slope and leveling system for heavy construction equipment like dozers, excavators, compactors, graders, scrapers, skid steers, and more. JohnnyBall utilizes industry-standard 3D slope and level indicators. It’s easy-to-operate design eliminates guesswork, confirms accuracy at a glance, and reduces rework. JohnnyBall uses a compass like design where the inner ball has industry standard level and slope indications printed on it and the outer ball carries a stationary dot to indicate the true attitude of your machine. This provides a true 3D level and slope perspective at a glance. A three ball system covers most landfills and sets up 6 machines. 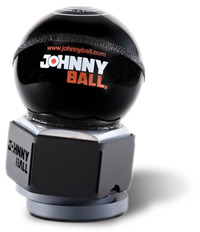 JohnnyBall is portable, use it with any brand, any machine, any size. Managing level and slope on a landfill has never been easier. Keep the work of your everyday challenges in front of JohnnyBall.